Is it wrong to want to see you to know just where we stand, To take a walk along the beach together hand in hand. I can’t help but think and wonder, as I sit here on the sand, when we’ll walk here together you and I just hand in hand. This poem is about friendship and confiding love that fuchsias symbolize. 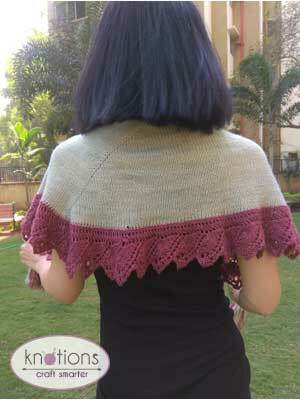 I designed this shawl with love and friendship as themes. This shawl with its fuchsia leaf lace border is an ode to those precious moments of togetherness, of friendship, of love, as you walk along the beach, as you speak silent words, as you laugh out loud, as you watch the sunset together, as you enjoy the cozy warmth of a bonfire or gaze at the night sky. 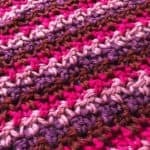 Knit this shawl to celebrate and savor such moments, wear it on those special evenings or nights, or gift one to those special people in your life. 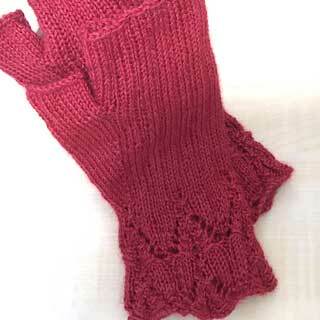 Thanks to Eden Cottage Yarns for yarn support on this design! 22 sts and 28 rows = 4” [10 cm] in St st after wet blocking. Please see our standard knitting abbreviations. 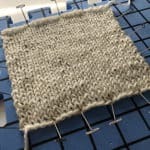 Kyok – knit, yarnover and then knit the same stitch. 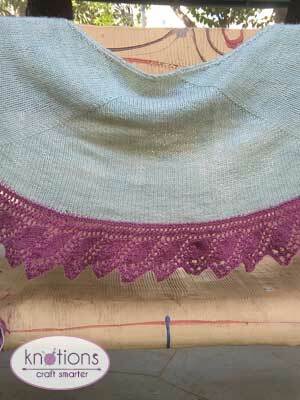 The shawl is knit top down beginning with a garter tab, followed by a stockinette section. The deep crescent shaping is achieved by strategically placed yarnover, kyok and lifted increases. 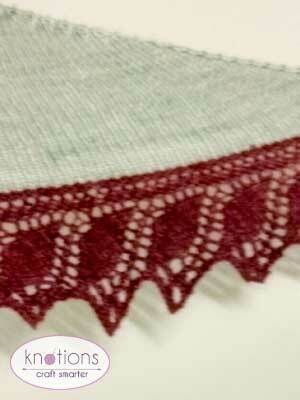 Finally, the fuchsia leaf lace is attached as a knitted on border. The shawl is knit in one size, but is customizable to smaller/larger sizes by decreasing or increasing the final stitch counts and accordingly varying the lace repeats. 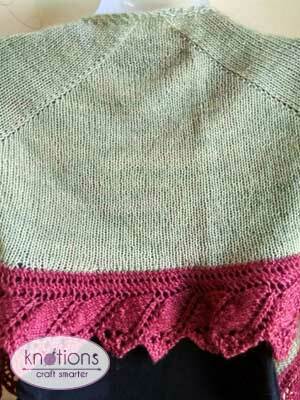 Note: Do not slip the edge stitch or knit it too tightly as that will make the edges too tight to stretch properly during blocking. With smaller needles and MC, CO 3 sts and k 10 rows (5 garter ridges). Rotate work and pick up 5 sts along the side of the rectangle (one for each garter ridge). Rotate work again and pick up 3 sts along the cast on edge (total 11 sts). Note: From this point onwards, the two sts at each edge will always be knit on both RS and WS rows. All increases happen on the RS rows only. On the WS row, there are no increases and you will simply purl in between the garter edges. In this section, you will increase 6 sts every RS row – 4 sts increased using kyok increases at either end and 2 sts increased in the central section using left and right directional increases. The st count increase is the same between the markers, so each section will have an equal number of sts. Repeat the above two rows until you have a total of 183 sts (61 sts in each section). In this section, you will increase 4 sts every RS row – 2 sts increased using yo increases at either end and 2 sts increased in the central section using left and right directional increases. Repeat the above two rows until you have a total of 243 sts (76 sts in the two outer sections and 91 sts in the central section). In this section, you will increase 6 sts every RS row – 4 sts increased using kyok increases at either end and 2 sts increased in the central section using left and right directional increases. Repeat the above two rows two more times until you have a total of 261 sts (82 sts in the two outer sections and 97 sts in the central section). In this section, you will increase 7 sts on the RS row – 4 sts increased using kyok increases at either end and 3 sts increased in the central section using left and right directional increases. Next Row (WS): K2, p to last 2 sts, k2. Cut yarn. After you finish this section you will have 268 sts (84 sts in the two outer sections and 100 sts in the central section). Using CC and a cable cast on, CO 16 sts at the end of the last row on the right end of your work. Turn work. Set up row 1 (WS): K15, k the last st from the border together with the first st of main body of the shawl through the back loops (abbreviated as k2togtbl* moving forward). 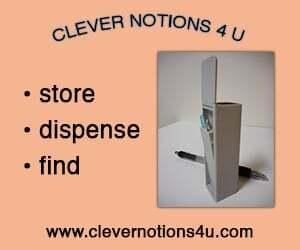 (1) On the RS, you always sl the first st kwise, wyb. Be sure to tug the yarn tight after slipping the st.
(2) The body sts are incorporated or joined with the lace border on the WS by knitting the last st of that WS row and the corresponding body st, through the back loop using the k2togtbl st. If your MC and CC are of the same color, you can do a simple k2tog, instead of k2togtbl. (3) Be sure not to drop the double yarnovers on rows 5 and 9. 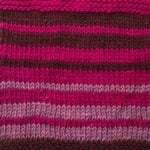 (4) When you knit a double yarnover (yo twice on rows 5 and 9) on the RS row, you will k and p them on the WS row. (5) For every 12-row lace repeat, you will be incorporating or knitting up 6 sts from the body. (6) It would help to place a few markers at multiples of 6 or 12 sts, so you know you are not missing any of the body sts and messing up your st count. I like to have a moving marker every 12 sts, so I know I’m not missing any sts or lace rows. Using either the written or charted instructions, work 44 repeats of the lace border (Rows 1-12), knitting together the last st of the border with the next st of the main body of the shawl through the back loops until you have just the 2 garter sts rem. 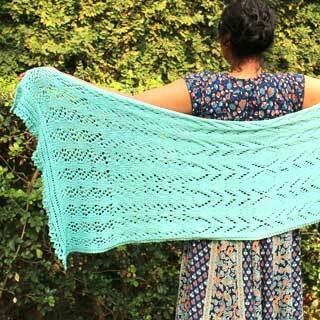 You will now knit together each of these edge sts with the lace border, through the back loop. Final border row 4: BO kwise until you have two sts remaining. K the last two sts together and then BO. Note: The set up row is the foundation row and is worked just once. After completing 44 repeats of the lace border, you will have 2 garter edge sts remaining on the main body of the shawl. 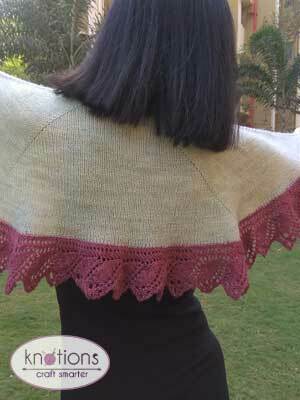 You will now knit together each of these edge sts with the lace border, through the back loop. Wet block the finished shawl into a deep crescent shape, pinning out the points of the leaf border. When completely dry, unpin and weave in all ends. 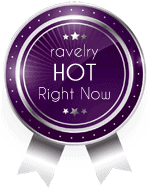 Optionally, add tassels to the shawl. 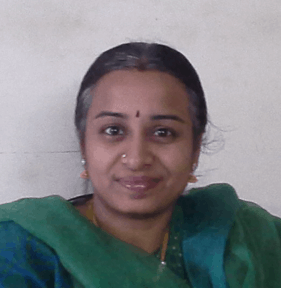 Jayalakshmi (aka Jaya) is a full time mom to twin girls. In the little precious “me time” that she gets, she packs in some knitting. Her personal design philosophy is to create quick, simple, preferably seamless, yet elegant knits that are as fun to knit as they are comfortable to wear.